Fourth-ranked Hartford will make the long trip to No. 2 Pike Valley with the winner advancing to the Eight-Man, Division II Sub-State semifinals. On Tuesday, Hartford beat Waverly 68-48 behind a huge night from senior back Clayton Fowler. Fowler rushed for 330 yards and eight touchdowns in the Jagaurs’ win. He accounted for all but two of the Jaguars 68 points on the night. 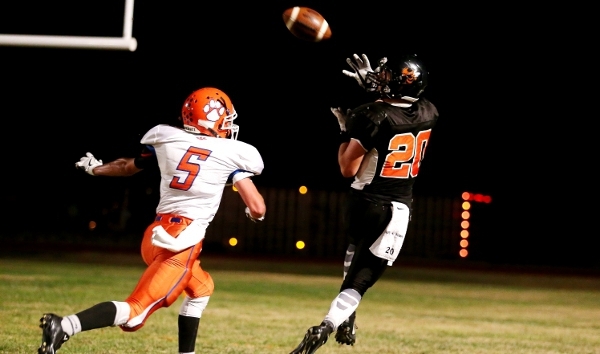 After an All-State season a year ago, Fowler has bettered his numbers this fall. He’s rushed for 1,494 yards this season compared to 1,015 rushing yards last season. Last year, Fowler also had 585 receiving yards and scored 30 total touchdowns. His quarterback, Danen Kistner, has thrown for more than 1,200 yards on the season. Tuesday night, Hartford grabbed a 32-22 halftime lead and led again by 10 points in the third quarter. Waverly made a push as Peyton Mitchell scored twice to give the Bulldogs as 42-38 lead last in the third quarter. Fowler would then score the game’s next three touchdowns to allow Hartford to regain control 62-42. Hartford had defeated Waverly 60-14 in the season-opener, but Mitchell wasn’t at full strength for the Bulldogs. On Tuesday, Mitchell rushed for five touchdowns. Hartford’s lone loss came 62-12 to 8M-I’s No. 3 Burlingame back in Week 2. Pike Valley also enters Saturday’s matchup with one loss on their record, and like the Jaguars, it came against a ranked 8M-I opponent. Osborne stopped a late Pike Valley two-point conversion attempt to preserve a 34-32 win over the Panthers back in Week 4. Since then, Pike Valley has won six straight games by averaging 53 points per game while giving up only 9 points per contest. During that span, the Panthers closest game was a 40-34 win over Beloit St. John’s-Tipton in Week 8. On Tuesday, Pike Valley cruised to a 54-8 win over Wakefield in a game that ended at halftime. The Panthers scored 30 points in the first quarter and added 24 more in the second. Junior quarterback DeVante Hammer passed for 68 yards and three touchdowns. Two touchdown passes went to Cole Strickler totaling 42 yards, and the third to Lane Peters. Peters, Pike Valley’s standout junior back, rushed for 144 yards and three scores in the game. He’s rushed for 1,315 yards and 25 touchdowns after totaling 1,594 yards and 30 touchdowns in receiving All-State honors as a sophomore last fall. Peters and the Panthers will need to control the ball on Saturday and somehow try and limit Fowler’s big plays. This game will take place one year and one day since Sharon Springs-Wallace County standout Luke Schemm passed away. Schemm collapsed during last year’s first-round playoff win against Otis-Bison. These two teams have often been ranked in the No. 5 spot in the Eight-Man, Division II poll this season. The two squads are perennial playoff qualifiers, but this is the first meeting for the schools since Wallace County started its current run of playoff appearances in 2006. The Wildcats currently have the longest eight-man streak of postseason appearances. South Barber has a 511-122 margin with the No. 31 strength of schedule, while Wallace County has a 327-178 margin with the No. 5 SOS, according to Prep Power Index. The Wildcats’ three losses have come against undefeated St. Francis and Dighton, along with two-loss Atwood-Rawlins County. South Barber fell 40-26 to Argonia-Attica in Week 4, an eventual two-loss team. The Wildcats, long known for defense, have held opponents 18.43 points under their season average in games when they haven’t played Wallace County. Credit to South Barber’s defense, which permitted 32.2 points a game last season and has dropped to 12.2 a contest this season. Its defense has held opponents 20.57 points under their season average in games when they didn’t play South Barber. In the first round of the postseason, both teams pulled away in the second half. The Wildcats trailed late in the first half at four-win Stockton. After intermission, Wildcat senior fullback Grady Hammer helped the Wildcats deliver a 48-18 victory. SSWC scored the game’s final 36 points. Hammer, who has played the majority of the season with a cast because a Week 1 hand injury, collected 232 rushing yards and a score. Hammer started the season at quarterback but switched to fullback when he returned. Senior Levi Johnson has played capably at quarterback for a team that had just 13 healthy players Tuesday. Hammer has 64 carries for 606 yards and six rushing scores. Johnson has 691 passing yards, 568 rushing and has accounted for 26 touchdowns. Wallace County averages 5.8 yards per play. The Wildcats are plus-11 in turnover margin and have five non-offensive scores. South Barber used the passing game to defeat Minneola, 60-32. South Barber trailed late in the first half but scored on a touchdown pass from Grant Cantrell to Trae Rathgeber. The Chieftains led 32-26 at halftime. Cantrell has delivered a great season with 85 of 117 passing for 1,352 yards with 28 touchdowns against three interceptions. Sophomore Neal Gugelmeyer has 99 carries for 1,007 yards and 15 scores. Cantrell has 131 carries for 797 yards and 14 rushing TDs. South Barber has averaged 8.6 yards per play. The Chieftains are plus-11 in turnover margin. As well, South Barber has six non-offensive scores. South Barber has made the necessary improvements to become an elite team after a 6-3 season a year ago. The key will likely come down to South Barber’s passing offense versus the Wildcats’ passing defense. Wallace County’s most offensive trouble came against Dighton and its excellent passing attack. However, Wallace County is 6-0 in quarterfinal matchups since ‘06. As well, the Chieftains have to travel more than 210 miles to Sharon Springs. The Wildcats are 5-1 in its last six home playoff games. Throughout the year, Wallace County has played well against teams with more depth and all-state talent at key skill positions. The Wildcats earn the win.